From the 1810s until the 1870s, plains bison (Bison bison bison) were a main source of survival and income for the Métis. In Michif, plains bison are called “li buffloo,” despite the fact that bison and buffalo are two separate species. Although there are no true buffalo native to North America, many Indigenous peoples, including the Métis, refer to bison as such. The Métis used bison hides to make clothing such as hats, coats, blankets, leggings and gloves. They also used the meat to feed themselves and to trade. The Métis went on two major hunts a year: one in the fall and one in the late spring or summer. The hunters and their families often travelled for several months at a time. Sometimes, Métis hunting parties included as many as 2,000 people. There were two main reasons to have such large hunting parties. The first was to provide protection from rival Indigenous nations such as the Sioux (Dakota) and the Blackfoot (Siksika). The second reason was to have a large force with which to approach the enormous herds. Métis bison hunts included a general or chief and several captains who each led a group of 10 men, or “aen dizain” in Michif. The hunt had to be organized because the whole community often relied on bison for food. Even prior to the bison’s near decimation in the 1870s, the Métis recognized that the animals were a finite resource that had to be protected. During the hunting season in 1840, the Métis codified the protection of this invaluable resource through rules referred to as the “Laws of the Hunt” or “Laws of the Prairies.” This set of laws forbade buffalo hunting on the Sabbath, enforced running and patrolling rules, and defined clear punishments for offenders of the laws. Bison hunters rode horses known as “buffalo runners.” These swift, powerful horses were needed to run straight and to maintain their speed while the hunters loaded, aimed and shot their guns. Good buffalo runners had to be carefully trained so they would not panic when running in the large bison herds. Hunting took a great deal of skill for both the horse and rider. Many Métis became successful ranchers and cowboys due to the useful skills they acquired from bison hunting. Métis women were also essential to the bison hunts. They would follow in carts, and once a hunter took down a bison, he would leave a “glove as a token.” The women would then take the carcasses and use them to prepare pemmican. 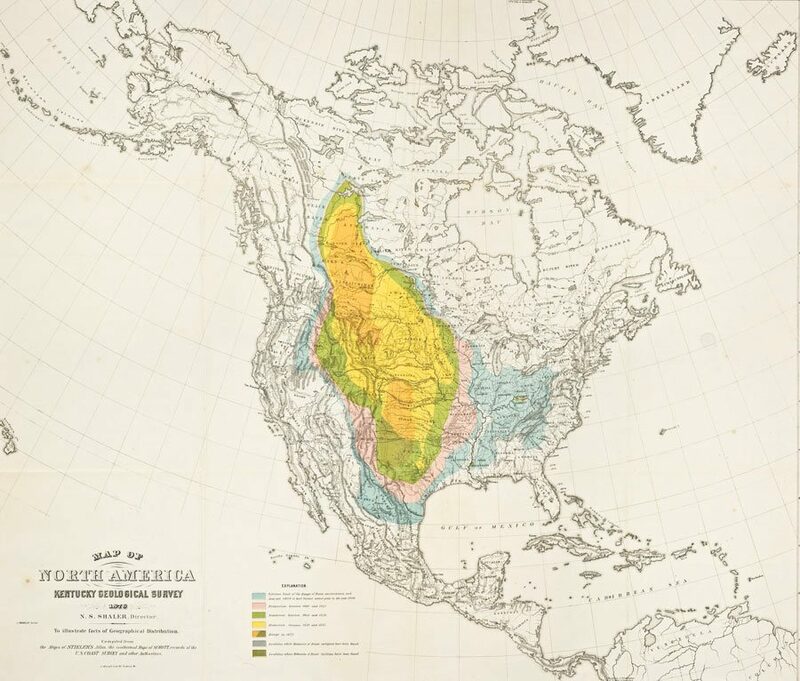 Historical map of evolving bison range from 1876. Métis bison-hunting camps were highly organized and ruled in a strict military fashion, yet the Métis also practised a form of consensual democracy during the hunt. Informal assemblies led by Elders met before each hunt, to ensure that laws were implemented. Once all the carts were assembled in the camp, a council consisting of a chief and staff officers was selected by consensus, as were captains, soldiers and guides. The carts were organized in a circle for protection, with the tents in rows at one end. If danger was imminent, the horses were also kept within the circle. Guides were charged with overseeing the camp’s operation while it was on the move. This responsibility was given on a rotating basis, and each guide served for one day. A flag was used to signal the camp’s moving and halting, and once the flag was raised, the camp had a half-hour to prepare to move. As long as the flag flew, the guide whose turn it was to serve for the day was in charge. The flag was lowered in the evening, signalling encampment for the night and the end of the guide’s duties. Once the flag had been lowered, the captains and soldiers took control of the camp, organizing it for the night and ordering the carts into place. Métis bison-hunting camps were highly organized and ruled in a strict military fashion, yet the Métis also practised a form of consensual democracy during the hunt. Informal assemblies led by Elders met before each hunt, to ensure that laws were implemented. In the late 1870s, the bison population was in a steady decline, and by the 1880s, Métis, Plains First Nations and Euro-American and Canadian hunters were competing for the dwindling plains bison herds. With the development of a new tanning process that enabled hides to be turned into leather machine belts, bison hides were in greater demand in Eastern Canada. Non-Indigenous hunters used repeating rifles to kill countless bison for their hides, leaving the carcasses behind to rot. They also poisoned the carcasses with strychnine in order to kill the wolves that would feed on the deserted carcasses. The wolves, like the bison, were valuable for their skins. A major role in the bison’s demise was also U.S. government policy aimed at taking away a key food source for Indigenous peoples, thus restricting their independence. The Canadian government in turn used the demise of the bison to coerce Indigenous peoples to comply with government settlement policy. The bison’s demise greatly changed the lifestyles of the Métis and other Plains Indigenous peoples.